Many people have pets, and like humans, pets can get sick and need some medical help here and there. Animals alike can get a respiratory illness or disease where they are not taking in enough oxygen, just like humans. If you notice any odd symptoms with your pets’ breathing, take a trip to the vet to get your furry friend checked out. The veterinarian will determine if you pet needs oxygen, and if they feel your pet could benefit from oxygen they will write a prescription. The prescription will be for a specific amount of oxygen, so make sure to follow that unless instructed by your vet otherwise. 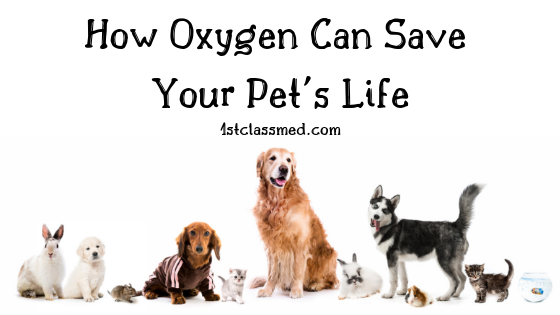 Other uses of oxygen in pets are for surgeries and emergency situations. Why Do Animals Need Oxygen? Pets often need oxygen for similar reasons as humans, they can develop lung cancer, congestive heart failure, pulmonary issues, etc. Pets, like us, can develop a number of illnesses that can limit the amount of oxygen their lungs are getting, further limiting the amount of oxygen to the rest of the body. Our pets can also develop other illnesses that can be specific to pets, that may not have a human comparison. They may also need supplemental oxygen during a surgery or in an emergency situation. Like us, during surgery supplemental oxygen may be given to help keep vitals at a healthy and safe level for the animal. Another situation that may require supplemental oxygen is an emergency situation, as it can help bring back vitals that were low and keep oxygenated blood flowing throughout the body to the animal’s organs. Often during surgery or in an emergency situation your animal may receive oxygen in a handful of different ways that may be best suited for your pet and cause them the least amount of stress. An animal that is struggling to breathe and stressed out can have a hard time with some of these methods, so your vet may determine a better option for your pet. 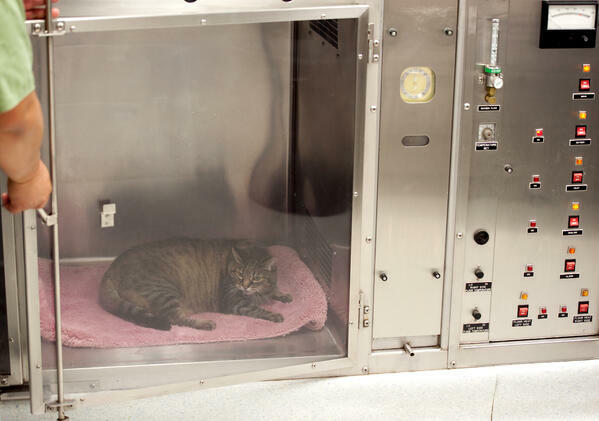 Oxygen therapy can be very beneficial to animals who are in need of additional oxygen during surgeries or in an emergency situation. The downfall to oxygen therapy in animals is that it can become difficult to decide between the importance of supplying the animal with oxygen and stressing the patient when trying to do so. The cause of an animal needing oxygen, such as heart failure and lung cancer, can be the cause of unsuccessful oxygen therapy. A severe illness that requires oxygen may not be resolved with oxygen, as it is more of a short-term treatment. Oxygen therapy in pets is used as an additional tool in treating an illness, but it will not solely heal an animal. Your vet will give you more detailed answers based on your pet’s health. More often than not, your pet will be on oxygen for a few hours and will be fine after with no effects. 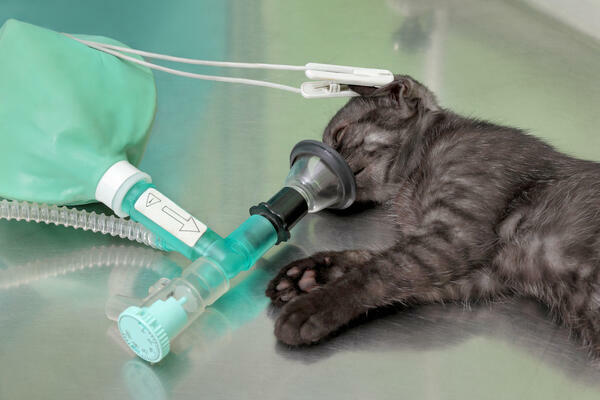 The goal for many pets is to provide them with enough supplemental oxygen during a surgery or emergency situation so that they do not go into organ failure. Some animals may need ongoing oxygen supply for an illness or disease, but it can be challenging for a pet. The quality of life in the animal may be very low with 24/7 oxygen, so a deep discussion with your vet about quality of life is key. The cost will be different for everyone and will be based on how your vet charges for oxygen. Normally oxygen is charged by every half hour and can incur additional fees depending on the vet. Average costs range between $80 and $125 for every half hour of oxygen use. With most things, prevention is key. Doing what you can to prevent your animal from experiencing any trauma that may cause an emergency trip to the vet. Having routine care for your pet can lessen any emergency visits by being proactive with any possible heart or respiratory disease. Early detection can make it easier to treat early and stabilize the animal before a trip to the emergency vet occurs. When taking your dog for a walk, keep them on a leash and far from roads to prevent any possible injury. Make sure your pet is microchipped (if applicable) and make your home safer by keeping windows and doors locked when they are not supervised. Our pets are a huge part of our lives, and they can get sick and need help just as much as we can. Sometimes oxygen is used for animals during surgeries or emergency situations that may require supplemental oxygen. One of the most important things about owning a pet is to take them to get regular checkups to be proactive when there is a possible diagnosis.